It is with much pride that Bricking Solutions introduces their newest bricking machine, the EZFlexx50. The EZFlexx50 improves upon the industry leading EZFlexx bricking machine with innovative designs on both the frame and the arches. 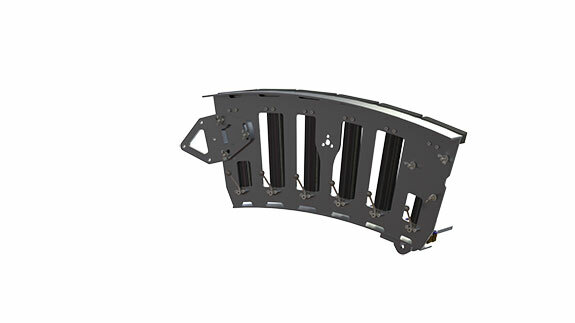 These new designs not only significantly decrease assembly and disassembly times, but cut down on the overall weight of the machine and allow for much easier maintenance of the machine, all while maintaining Bricking Solutions’ industry leading capacities and work platform sizes. As has been the standard for Bricking Solutions equipment for decades, the frames of the EZFlexx50 are made from 6061-T6 Aluminum – providing all the strength of steel at 1/3 the weight. Beyond that, though, is where the innovations starts. 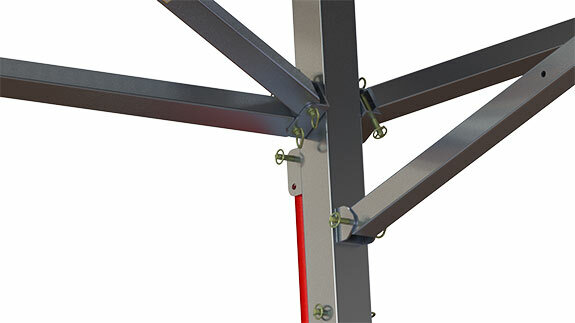 The main frame legs are no longer rigid, welded structures. Instead, they fold and unfold. 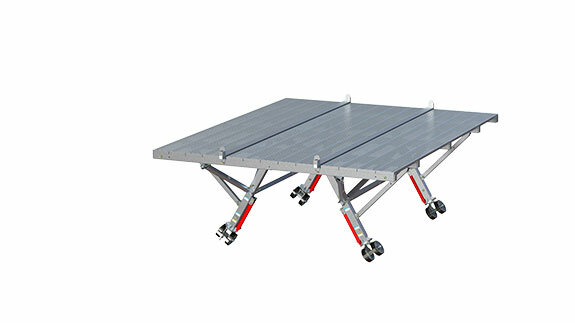 This allows for easier storage, transportation and assembly all without sacrificing safety or strength. Assembly of the frames has also been vastly improved. This has been done by re-engineering the frame structure to remove complexity and provide symmetry. While those two alone would have simplified the assembly greatly, Bricking Solutions took it one giant step further by removing all the bolted connections and replacing them with pins and retainer clips. No more digging around for the right size bolts, just grab a pin, insert and go. Once the frame assembly is completed, you end up with the lightest frame assembly in the industry; one that took about 10 minutes to put together. 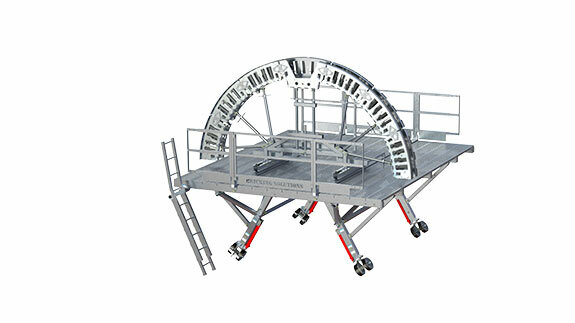 We have tested and proven that an experienced crew can easily assembly the frames in 10 minutes. Once the frames are assembled, the decking only takes a few short minutes more to install as it, too, is now symmetrical and secured with hitch pins. One of the most noticeable improvements on the EZFlexx50 is the arch. By adding cutouts to the arch panels, each panel – and thereby the overall arch- weight has been greatly reduced. 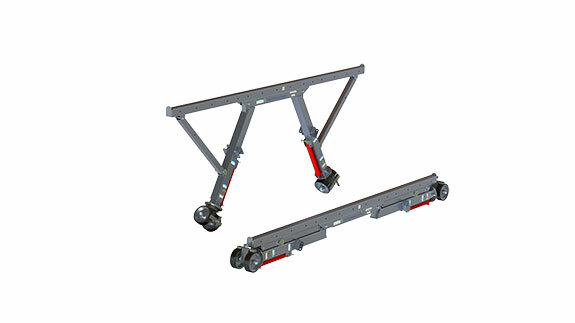 This weight reduction contributes to ease in carrying (1 person per panel) and assembly. The unique design also allows for easy inspection of the cylinders and hoses. Attaching one panel to the next is done with three wing-nuts. The one thing that should be most apparent throughout the assembly process is that there are no tools needed. No wrenches, no screwdrivers, no micrometers. Just a crew of 4-5 men. The arch adjustment on the EZFlexx50 has also undergone changes to make it easier. By utilizing screw-jacks, the complete arch can be quickly raised or lowered as needed, whether going through a tapered area or having to deal with major kiln distortion. The wing panels are also easily adjustable via the wing-nuts that hold the hinge plates in place. All of this adjustment adds up to quicker throughput time during your bricking process. New for the EZFlexx50 are repairable cylinders. 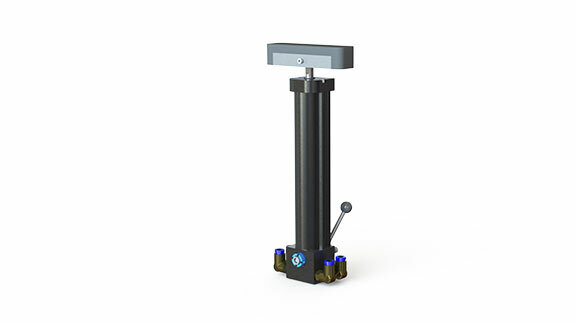 Unlike the previous cylinders, which were sealed with only the handle and valve replaceable, the seals in the cylinders on the EZFlexx50 can be repaired in the field. These same cylinders can be used on older machines as well. You will just have to open up the mounting holes a bit to accommodate larger screws. Now, for arguments sake, let’s say you have a 6-man crew that costs you US$200/man hour. You can see upwards of US$1050 savings in the first day of use over the competition. On top of that, you can gain what is, essentially, a shift of closeout. With disassembly going just as quick as assembly, you’ll save upwards of another US$1000 in labor at the end as well. That’s US$2000 you’ve saved with just one use, and that doesn’t reflect what you’ll save with increased efficiency while actually using the on the EZFlexx50. With all the engineering, R&D and testing that has gone into the EZFlexx50, one would expect the cost to increase. But, part of the scope of the redesign included revamping our manufacturing processes, which resulted in lower costs. This savings we are passing on to you, our customers. Written by Jeff Mirisola, BBS Technical Services.